Panelists shared tips on gaining coverage on brands' CSR activities. 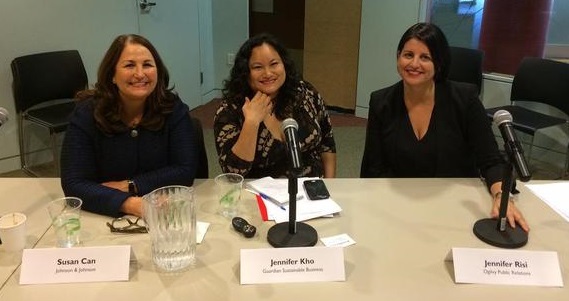 Panelists Can, Kho, and Risi spoke at Philanthropy Works. "It’s harder than ever to get coverage in the media for CSR efforts," says Jennifer Risi, MD of Ogilvy Media Influence and head of North American media relations. "Building a relationship with influential editors has to be a sustained effort." Risi was part of a panel held Thursday morning at the offices of Philanthropy Works entitled "Earning Stories for Good – Big Rewards for Your CSR Program." Having that media relationship already in place is what gets you through the doors when you have a story to tell, says Susan Can, senior director of corporate equity and partnerships at Johnson & Johnson. "It’s not like ordering a pizza," she says. "You can’t just pick up the phone when you’re hungry." Jennifer Kho, US editor of The Guardian’s sustainable business section, receives about 500 emails a day and says, quite frankly, "It’s easy for a pitch to get ignored." The Guardian’s sustainable business section gets about 725,000 unique visitors a month. A media relations pro can improve the odds for their pitch by providing "a clear point for readers. What is the takeaway besides saying ‘the company is great,’" says Kho. Very often the subject line is all she will see for the pitch – make it relevant, snappy, and specific. Messaging around CSR, says Can, "can’t be about J&J; it must be about the work. If there is a halo effect for J&J that’s great, but that is not the goal. Our goal is to use multiple channels to drive awareness and engagement for the work NGO partners do." Embedding a media relations associate within her team has been a big help, she adds. The brand has created a platform that all partners can collaborate on rather than having NGOs working on separate one-off initiatives. Can cited successful efforts including its sponsorship of the Huffington Post’s Global Motherhood section to raise awareness about health issues affecting mothers and children and to provide information about its 150 NGO partners. The brand’s Donate a Photo initiative has also helped a number of NGOs, including Water.org, which was able to provide safe water for almost 600 people. "Authenticity is what resonates with audiences," says Risi. "Paid is safer, but not credible." Kho agreed, citing Coca-Cola’s move to focus on health messaging. "Readers do not connect Coca-Cola with health," she says, suggesting that PR and comms pros "take a look from the outside world" when crafting any message. And while social media generates the most buzz, "traditional media is still the most important channel," says Risi.